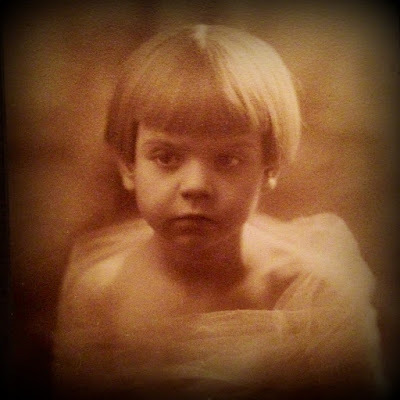 My maternal grandmother, Dorothy Coy, has always been a source of inspiration when it comes to my own style. My Mom often says I remind her of my Grandma. Like me, she loved to entertain and always paid special attention to even the smallest details of a dinner party or holiday celebration; she had shoes and purses to match every dress; and she loved to get gussied up (usually for an evening at the Moose Lodge). We even shared similar taste in clothes - despite the generation gap, the brown leather jacket she wore in the 1940s is the most treasured item in my closet. 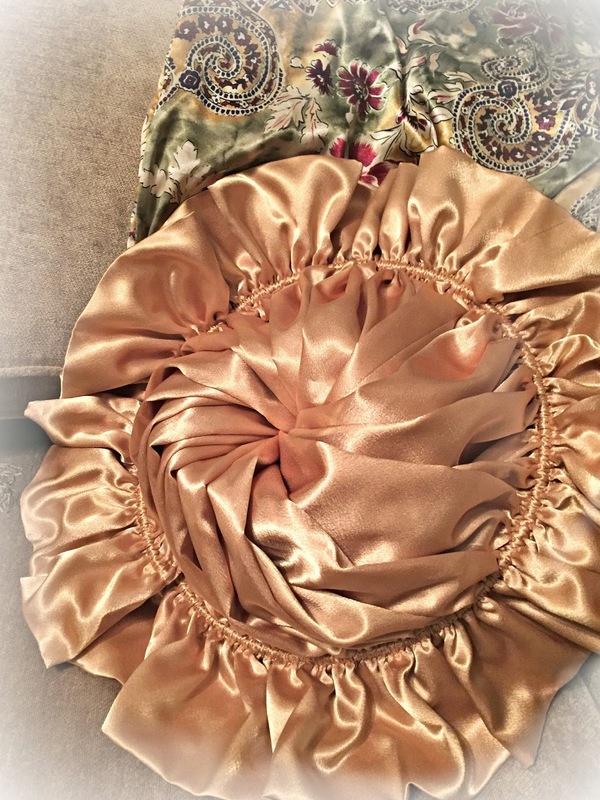 The gold satin throw pillow is actually a clever storage solution that was patented by my grandmother and her sister-in-law in the 1950s. I still find it useful today. My grandmother was also immensely talented. 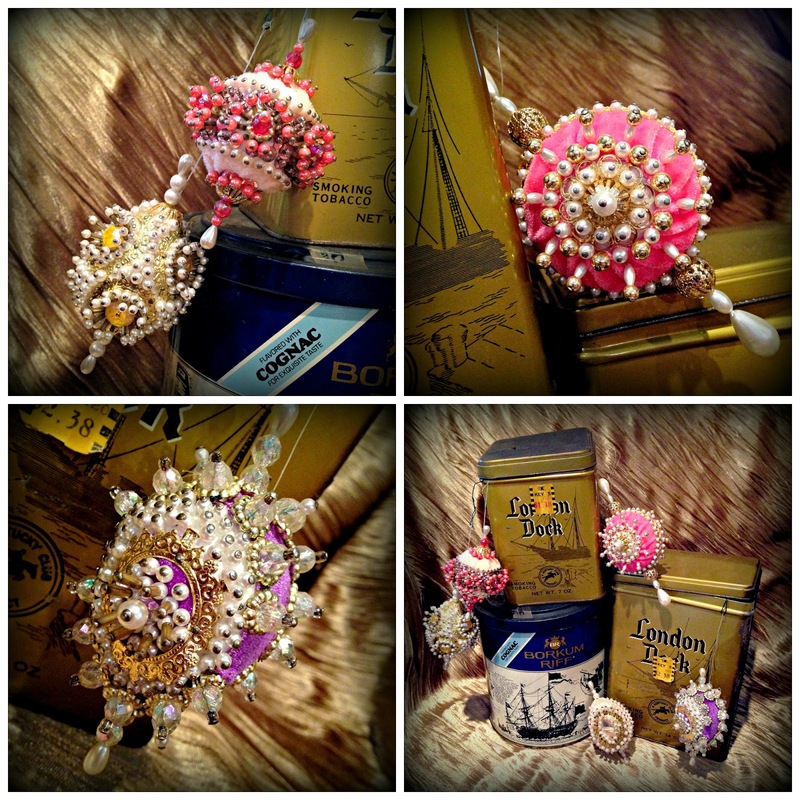 She sewed; she crocheted; she made intricately detailed and complex jewelry and holiday ornaments. Thankfully, I have a number of her creations that I still use and enjoy today, keeping her with me in spirit though it's been more than 20 years since she passed. And yet, I learned only recently that her skill and creativity were actually patented... In 1955, Grandma and her British ex-pat sister-in-law, Mary, developed the Coy Pak-a-Pillo, for which the two women were issued a United States Patent! 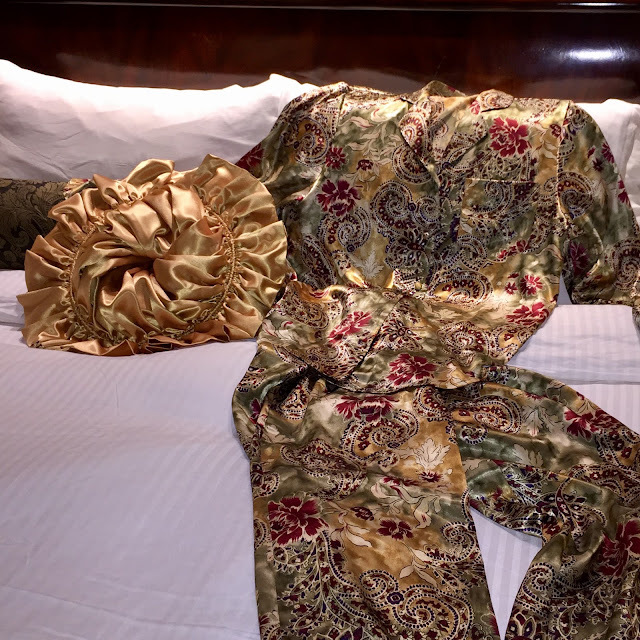 Confession: my pajamas don't always match the decor, but this satin paisley set is one of my faves. They were a gift from my youngest sister and I've had them for more than a decade. 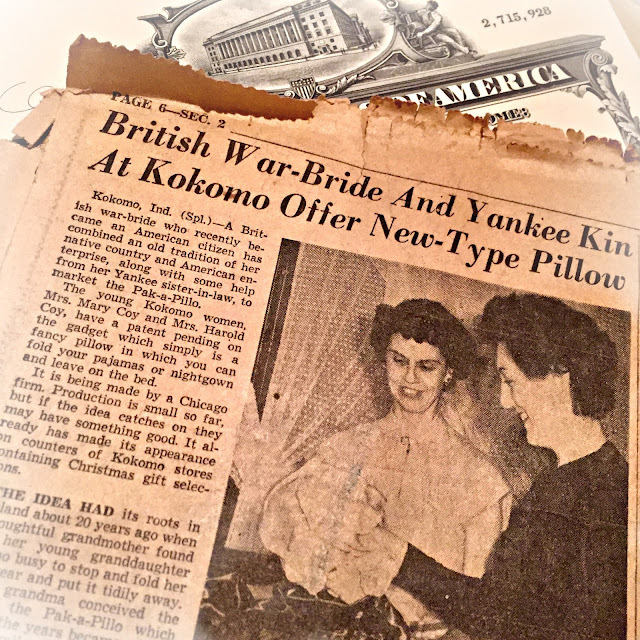 The Indianapolis Star covered the story on December 14, 1953, reporting on the then patent-pending "gadget which simply is a fancy pillow in which you can fold your pajamas or nightgown and leave on the bed." Their collaboration came about shortly after Mary immigrated to the US and observed that Americans were simply too rushed to put their bed clothes tidily away each morning. Rather, as the Star reported, it was customary to fold them under a pillow when making the bed, "hang [them] on a nail some place or chuck [them] into a drawer. Children, she noticed, preferred tossing [them] on the floor." I love the Headline for the Indianapolis Star's coverage of the Coy Pack-a-Pillo on December 14, 1953. My Grandma Coy is on the left and my Great Aunt Mary is on the right. The Pak-a-Pillo offered a stylish alternative, and "the two Mrs. Coys" hoped it would catch on when people discovered they could simply stuff nightgowns and pajamas into the pillows (no need to fold) and enjoy a decorative accent at the same time. The original was made entirely by hand, but to facilitate mass marketing, they tweaked the design so that it could be machine produced; applied for a patent; and sold production rights to a Chicago firm on a royalty basis. "Look, Ma, no makeup"... I don't devote much of this blog to beauty and skin-care regimens, but I am a firm believer of taking off makeup before I go to bed. My Grandma Coy always had beautiful skin even as she aged; I hope I inherited that from her. My Aunt Linda, who recently gifted me with the original patent certificate and related paperwork, remembers going with my Grandma to a meeting about the product, which she describes as eloquently as I might. 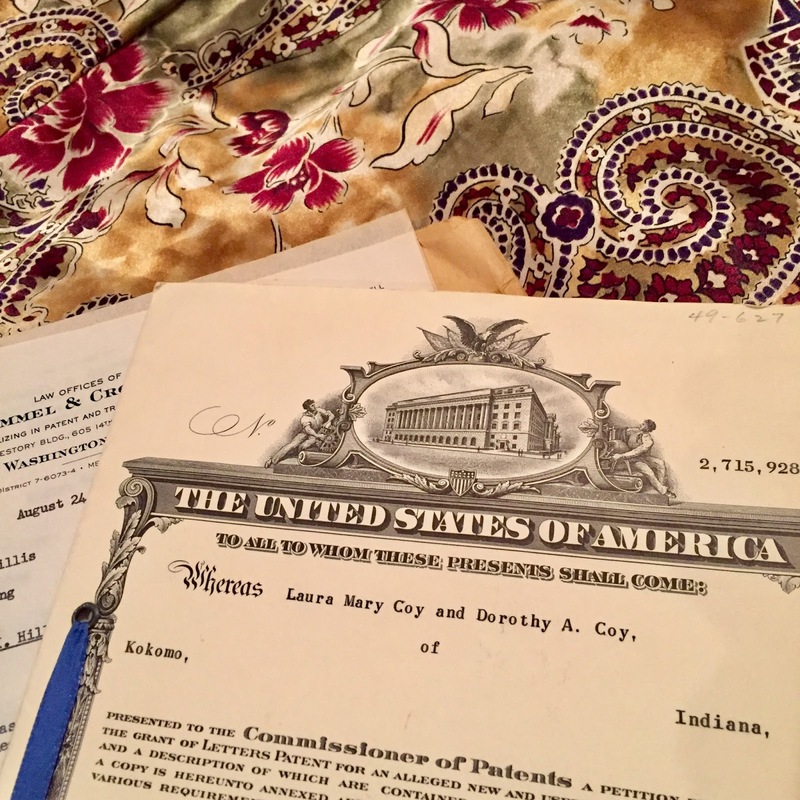 She recalls: "When I was 11 or 12 years old I went with my mother to a meeting with someone about the patent that Mom and Aunt Mary were applying for. It was for what they called the Pak-a-Pillo. 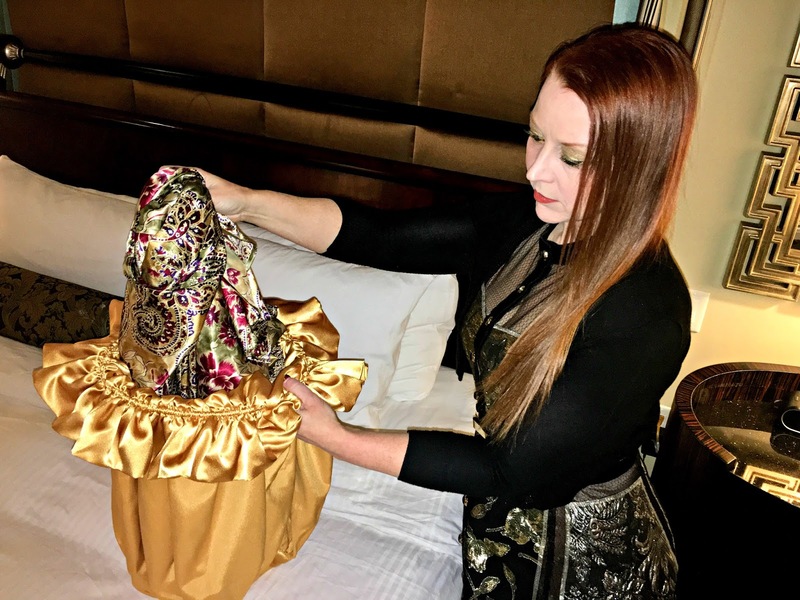 It was a satin bag with a wire and a ruffle at the top that twisted down into a fancy pillow that went on the bed and held night clothes during the day. Mom told the interviewer how handy it was. He turned to me and asked what I thought of it. I told him the truth. I said it was a lot easier to just put my pajamas under the pillow. I suppose I remember it so well all these years later because Mom wasn't very happy about my answer." It was fascinating to read through all of the paperwork for my grandmother's patent, and I treasure this bit of family history. I don't disagree with Aunt Linda - it is a bit simpler to just stuff your nightgown under a pillow, but lacks the panache of the Pak-a-Pillo. I've never seen one of the originals, which were sold at boutiques and department stores, but my Mom used the pattern to make me one as a Christmas gift. I don't store my pajamas in it, but I do use it on a chair in my bedroom. It holds hosiery and is far more useful than an ordinary throw pillow. I love it! As for my pjs, I'm ashamed to admit they usually end up on the floor of my closet. Great Aunt Mary would be appalled. The Pack-a-Pillo that my Mom made for me using the original pattern is one of my favorite Christmas gifts. For demonstration purposes, however, I recorded a very short video that shows how the Pak-a-Pillow actually transforms from a fancy looking laundry bag into a chic but practical decorative accent. You can see the video here. It may not have made her rich and famous, but I am beyond proud of my grandmother's accomplishments. She will forever be my own personal style icon. Hi Elizabeth, Thank you so much! I so agree with you about blog posts allowing so much more depth. This story was one that I was especially excited to share! I really appreciate you taking the time to read it and share your feedback!